Thanks to the great ladies at the One2One Network,I had the privilege of previewing CMT's first ever sitcom, "Working Class." The show stars beautiful Melissa Peterman and fabulous Ed Asner...a perfect combo if you ask me! Peterman plays Carli Mitchell, a single mom from a rough and tumble background, trying to give her three kids a better life by moving them to an upscale suburb. She quickly finds that making the transition to “the good life” is harder than she thought. She's unwittingly befriended by her cranky neighbor, Hank (Asner), her only “career” prospect is a glorified deli job at the local grocery store, and the man she falls for not only already has a girlfriend – but he’s also her boss, Rob (Patrick Fabian). 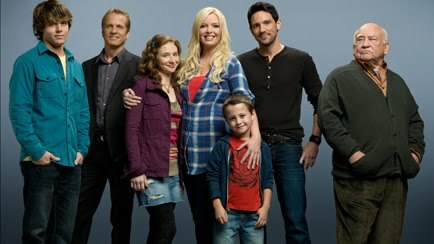 With her ladies-man brother, Nick (Steve Kazee), to help her out (when he’s not acting like one of the kids himself), Carli faces the challenges of parenting, dating, and making friends in her new community by doing more with less, staying true to herself and approaching each day with a touch of working class. My fiance and I watched the preview of the pilot episode and loved it! It was cute, quirky, and funny and the chemistry between all of the cast members is spot on! My favorite character is definitely Carli. She is down-to-earth and finds herself in embarrassing situations that we can all relate to. 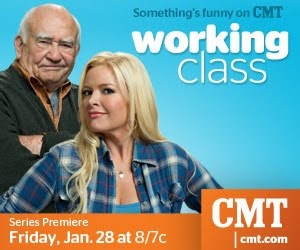 Here are some behind-the-scenes videos of Peterman and Asner on the set of "Working Class:"
Tune in to CMT on January 28, 8 pm EST to see the premiere of "Working Class" and check out the show's website here.